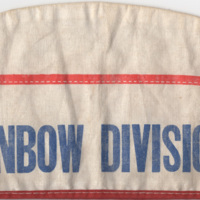 Hat worn by those in the 42nd Infantry Division, also known as the Rainbow Division. 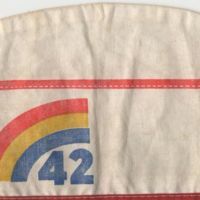 One side has a small rainbow with a blue 42 under it, other has "Rainbow Division" printed in blue. United States. Army. Infantry Division, 42nd, “Rainbow Division Hat,” No date, T100089, Thomas J. Koger Collection, Woodrow Wilson Presidential Library & Museum, Staunton, Virginia.